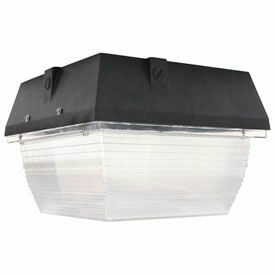 LED Canopy Light Provides Ambient Lighting for Applications Including Residential, Commercial, Corporate, and more. LED canopy light is made of high quality materials for lasting durability. 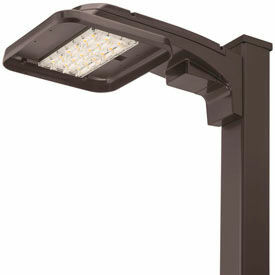 Unit provides optimal lighting for walkways, garages, entrances, and other outdoor environments. LEDs are cost effective, energy efficient, and provide up to 200,000 average hours of life. Diecast aluminum housing with polycarbonate lens ensures impact resistance for unit longevity. Wide flood beam improves lighting distribution for optimal visibility. Average life hours are 25000, 50000, 65000, and 200000. Mounting options are Recessed and Surface. Lumens range from 2582 to 11500. Color temperatures are 4000, 5000, and 5600. Wattages range from 33 to 100. Dimensions vary per model. LED Area / Site Lighting Is Used For Applications Including Public, Commercial, Industrial, And More. LED area & site lighting is made of die-cast aluminum for long lasting durability and corrosion resistance. Units provide external lighting for parking lots, overpasses, garages, and more. LEDs are cost effective, energy efficient, and provide up to 100,000 average hours of life. Wattages range from 70 to 248. Lumens range from 7800 to 32812. Color temperatures are 4000 and 5000. Average life hours are 50000, 60000, and 100000. Dimensions vary per model.